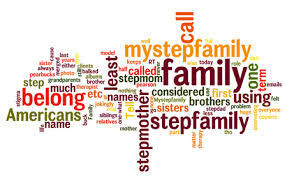 Are you in a step-family, blended or ‘curdled’ family, or as the Europeans call it, a ‘patchwork’ family? Do you and /or your partner have shared care arrangements with each of your ex-partners? Do you each have children from your previous relationships for which each of you are step-parents to the other partners children? Do you have children between you? How do you and your ex-partners collaborate and communicate? Have each of your ex-partners also re-partnered and do they have children with their new partners? Is it getting a bit complicated? Then you might be interested in this article about me and other step-families. 4. In each step family one or both partners has their own ex-partner with whom they may have a shared care arrangement for the biological children of their previous relationship. Both partners in the step family may have to negotiate difficult territory in maintaining a working relationship with a potentially hostile ex-partner for the benefit of their biological children from their previous relationship and also for their current relationship with their new partner and the children of that relationship. 5. Finally, here is a big one. One or both of you may have a child from your previous relationship who is alienated from you. After years of not relating with you your alienated teenager shows up at your front door (perhaps escorted by the police). Now what do you do? How does this affect your step-family and your partner? And what if your alienated teenager is your EX FACTOR incarnated? Complicated? You bet! Time and time again I have worked with step families who have struggled with at least two sets of shared care arrangements with hostile ex-partners who actively and passively interfere with their relationships with their biological children. On top of that, an alienated and troubled teenager suddenly enters as a chaotic and disruptive element to your step-family. Obviously an early casualty is the step family itself and your relationship with your new partner-unless you start being strategic and beat the hostile ex-partner at their own game. This is what we call THE EX FACTOR. One of the most insidious forms of parental alienation occurs when a hostile ex-partner works on their biological children to get them to sabotage the step family from the inside. As you can imagine, patience and tolerance are not infinite resources so biological and step parents differ in how they deal with this type of external interference (especially when it is their partner’s ex-partner who is the ‘spoiler’ ). An astute hostile and aggressive ex-partner knows exactly how to exploit this using the children as their weapon. Hence, what we call the EX FACTOR. One of the simplest and most effective ways of creating unmanageable stress in the step family is for your ex-partner to continually vary with little or no notice your shared care arrangements. Another technique that is often used is to continually interrogate your biological children about their experiences in the step family, using them as a source of intelligence to use against you but also to create a belief in their children, that somehow there is something wrong with your new family. The rules of a step family are subtly different from those in a nuclear family and even with an amicable and cooperative set of ex-partners you need to understand and appreciate the new territory that a step family opens up. It is even more imperative that you understand these new dynamics if the relationship between you and your ex-partner is not amicable and even hostile. If you do not understand these new dynamics, you can bet your hostile ex-partner will! It is axiomatic in family law, and indeed in family therapy circles that children vote with their feet. If they are not feeling comfortable in your step family then it will not take very much at all for them to walk. Sometimes it is what they need to do for their own wellbeing. Research is increasingly showing that social parents have a special role to play in the development of their partner’s children, unique and distinct in its own right as is the role of biological parents. The love between social parents and step-children is as strong as the love between biological parents and children. Many step-children’s live’s are immeasurably better because of a more beneficial family dynamic between their biological and step parents. It is up to you, either as a step-parent or a biological parent (or both) to make sure that your children have the best that your new family can offer. After all, isn’t that why you are in it? Do not let your life and your step family be ruled by THE EX FACTOR! Check out my interview on the ABC.